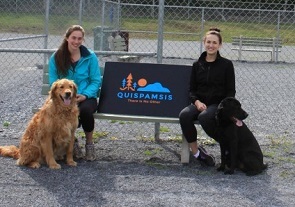 The Homestar Off Leash Dog Park (222 Vincent Road) is a great place for residents to come let their dogs shed some energy. With generous funding from the government and Homestar Inc. the fenced in space is a great atmosphere to socialize, exercise and play with your four-legged friend. All dogs are permitted to run free under their handler’s supervision. The grounds are a half acre in size with a trail that loops around the perimeter, connecting to Matthew’s Brook Trail via the Vincent Road pedestrian underpass. Please remember you are legally responsible for your dog and any injuries caused by your dog. Use of the park is at your own risk. The Off Leash Dog Park is open dawn to dusk, unless otherwise posted or advertised.